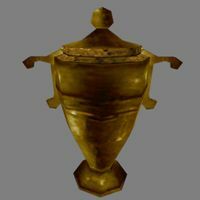 The Bittercup, or the Bitter Cup, is an artifact sacred to Clavicus Vile, and thus is highly prized by the followers of that Daedric Prince. The Cup was lost in ancient Chimeri ruins on an island in the Sheogorad region of Vvardenfell before it was recovered by the Nerevarine in 3E 427. This page was last modified on 9 July 2013, at 22:06.